Call it a case of the Stockholm Syndrome, if you will. Considering my previous history of the films of both Rohit Shetty and that walking pile of hubris, Shah Rukh Khan, I went in for this movie expecting something of a major migraine. The trip was more on account of my mum who, having seen poster images of female lead Deepika Padukone in a traditional South Indian silk saree and gajra, declared the film as a “must-be-seen”. 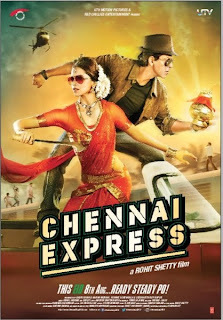 What took me for a loop from very early on is how light-footed and irreverent Chennai Express is in its adoption of masala cinema mores, even in its digs at SRK's own repertoire of self-aggrandizing dreck. An early scene which begins as a wince-inducing rehash of the insufferable climactic reunion from Dilwale Dulhania Le Jayenge (more on the DDLJ connections as we go ahead), veers into a sharply funny send-up of the same. This scene also establishes the complete madcap tone of the film – the heroine who has escaped from her hometown to Mumbai is running towards a train that is headed back there. If after this outright proclamation you're going to complain about lapses of logic and coherence in this script, you might as well point out plot holes in Tom and Jerry cartoons, because that's what most of the movie is, a zany live-action cartoon. I was apprehensive that CE would be an uneasy mishmash of Shetty's and SRK's trademarks, but SRK slips comfortably into Shetty's setup, displaying a rare self-deprecating humility. Bar exceptions like Kabhi Haan Kabhi Naa, I find it hard to sit through 10 min of a SRK performance without wanting to punch him in the mouth several times, but here he is (gasp!) fairly likable. Of course, in a certain sense, this film is like Terminator 3 (which also had mixed, predominantly negative reviews), in that it needed the legacy of SRK's brand for the spoofing to hit home. I suspect a good modicum of ad-libbing and improvisation was worked out between him and Rohit Shetty in the course of making the film, and in a nice way, it is reflected in the final product. What is also interesting is the film's mixture of Hindi and Tamil elements. Especially in the segments set in Tamilnadu, CE riffs on mainstream Tamil cinema as well, with a copious amount of (non-subtitled) Tamil dialog and the presence in pivotal and minor roles of well known actors of Chennai movie-dom. One can see it as a mirroring of the culture clash in the story. In that respect, the film has maximum resonance with Hindi film viewers that also have some familiarity with Southie cinema – if you do not recognize actors like Sathyaraj, Delhi Ganesh and others from their long-time legacy in Tamil films, you will not fully appreciate their presence in CE. Deepika Padukone and Niketan Dheer as the brawny baddie speak Tamil in accents atrocious to the point of being incomprehensible, but that again can be seen as a reflection of South Indian cinema's proclivity towards importing language-impaired leading ladies and villains. Yes, there are pacing issues – one too many songs and a cliched romance make for some very slack moments – but the major disappointment for me was the climax, which, especially in the wake of all the winking and fun-poking is a surprisingly straight-faced and therefore (yep, here it comes) wince-inducing rehash of the insufferable climactic reunion from DDLJ. The hero makes a speech about the tragedy of how in independent India, women are still held captive by patriarchy, after which he takes part in a slugging contest to win the hand of the bride who looks helplessly on, how's that for irony? So that's a bitter bit, but most of CE is palatably breezy and unlike many other so-called “family entertainers” actually mindful of keeping its violence and double entendre in check.